I have absolutely no clue where the month of April went, but I'll be closing it out in style with one last #BeerMonth post. Since I went in a savory direction for my last post, I steered towards the sweeter side of things this time. For the most part, I knew that I was going to make caramel. I just wasn't sure if I was going to make actual caramels or caramel sauce. If I was going to make caramels, I had to find a couple of things that, with more time, wouldn't have been a problem. But I got a late start (go figure), and decided to move the caramels to the back seat for now. But I've got big plans for them in the future, so keep your eyes peeled. So, moseying on up to the front seat was some trusty caramel sauce. 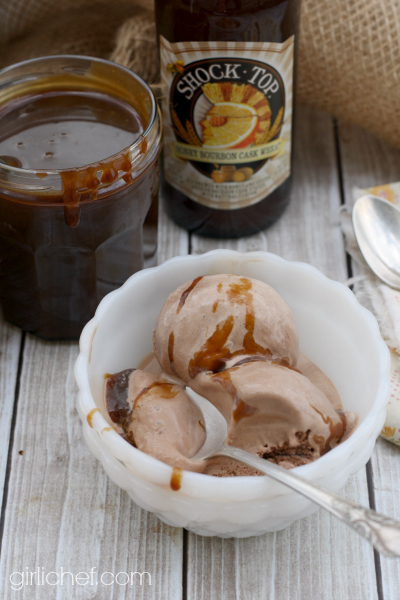 I've used beer to make caramel sauce before, so it wasn't an entirely new concept. It would be my choice of beer that made the difference. I wanted something that was a bit bold. I decided on Shock Top's Honey Bourbon Cask Wheat. Honey Bourbon Cask Wheat is an unfiltered wheat ale that's brewed with honey and caramel malt, and then aged on bourbon cask staves. Staves are the long slats of wood that make up the sides of the barrels. The wood soaks up the flavors and characteristics of the bourbon that it's holding, and in turn, lends some of those soft notes to the ale is it's aging. 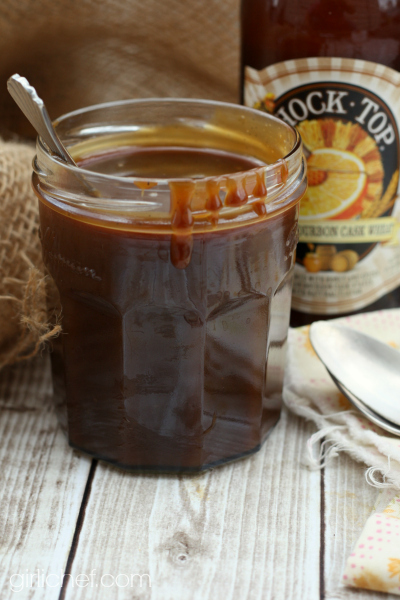 I also added a splash of bourbon to the caramel, lest you think I tricked you by including "bourbon" in my title. You can really taste the honey with spiced notes in the beer itself, so once you've reduced it down, those flavors really concentrate. I accented them with some cardamom, and tried to smooth them out a bit with the addition of vanilla (in two forms) and a bit of floral orange blossom water. I also chose to use dark brown sugar to add to the richness. The resulting caramel sauce is not for the faint of heart. It is bold, complex, and rich with faint bitter notes (but in a good way). Use it how you like, but it takes plain-jane chocolate ice cream and turns it into something magical. You know, if you like that kind of thing. 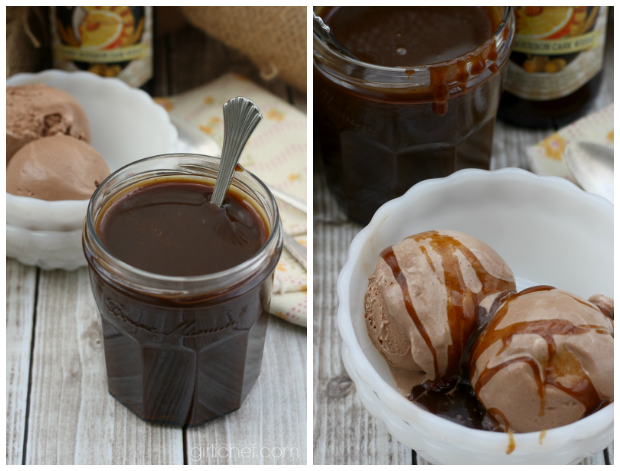 Magical ice cream with caramel sauce. 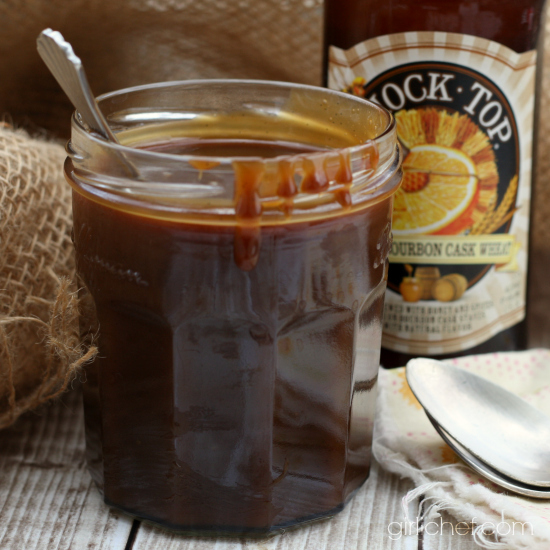 This richly colored salted honey-bourbon-beer caramel sauce is full of complex flavors; guaranteed to stimulate the most sophisticated palate. Bruise the cardamom pods a bit and scrape the seeds from the vanilla bean. Place the cardamom pods and the scraped vanilla bean ajd seeds into a large (really, large - this helps prevent boil-overs later) pot with the beer and bourbon; bring to a boil over medium heat. Cook, stirring, until reduced to about 1 cup. This will take around 10 minutes. Add the butter and brown sugar and let boil until thick and syrupy, ~10-12 minutes. To test for doneness, drip a bit of caramel into a bowl of cold water; it should form a soft ball when ready. Slowly stir in the cream and cook another 5 minutes, until sauce has thickened a bit. Remove from heat and stir in vanilla extract, orange blossom water, and sea salt. Remove cardamom and vanilla pod. Transfer to a jar and once cool, cover and store in the fridge. Reheat for a bit in microwave or set in very warm water, if you like. This is my second of two Beer Month posts (my first being Sweet 'n Tangy Beer-Glazed Chicken). 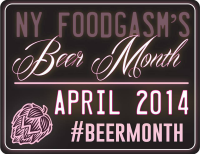 Beer Month was started by Sophia of NY Foodgasm, out of her love for craft beer, and in the spirit of never drinking alone! I saw we make every month beer month. Who's with me! ?